Napat is originally from Mae Sot and having been raised in this border town she realized the many challenges that people living in the area have to endure, especially issues related to refugees, migrants and health. Around 2000, Napat began working with a small organization that produced ceramic water filters with the aim of increasing access to clean drinking water and reducing waterborne diseases. In 2004, she had the opportunity to work in some of the Tsunami affected areas in the south of Thailand where water systems had been destroyed. In 2007, Napat joined Women's Education for Advancement and Empowerment (WEAVE) as Marketing Officer. After approximately two years with WEAVE, Napat decided to join the UNHCR as an interpreter assisting resettlement and immigration officers with interviews in three temporary shelters in Tak province. 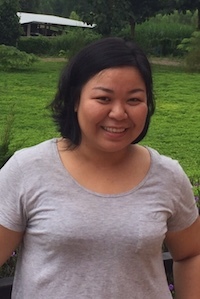 In 2010, Napat was promoted to Resettlement Assistant and in July 2014 she was reassigned to work in UNHCR’s Mae Sariang office where her position was retitled to Durable Solutions Assistant in late 2015. In July 2016, after approximately eight years with UNHCR, Napat decided to join SMRU where she is currently a Social Science Researcher and T-CAB Facilitator. Throughout her career, Napat has developed an interest in public health and health related issues facing refugees, migrants and villagers living along the Thai-Myanmar border. It is without question that access to basic healthcare, which is a fundamental right, is limited in these areas and such services should be made available and accessible to all. Napat’s knowledge and skills will be useful in this area and help to improve healthcare for those in need.